A scientific study finds that receptivity to e-cigarette advertising increases the likelihood of trying conventional cigarettes one year later. The research was funded by the National Institute on Drug Abuse (NIDA), part of the National Institutes of Health, and the Center for Tobacco Products, U.S. Food and Drug Administration. The study found that young people ages 12-21 who had never previously smoked, but were receptive to e-cigarette advertising, were 60 percent more likely to try smoking cigarettes one year later, compared to teens who were not receptive to the ads. Study participants were considered receptive to an advertisement if they reported liking or recognizing images from the ad. The researchers analyzed data collected from 10,989 participants as part of the Population Assessment of Tobacco and Health (PATH) Study, a national representative, longitudinal study of tobacco use and how it affects the health of people in the United States. The authors conclude tobacco product advertising is a continuing contributor to tobacco use among young people and call for more research on this cross-over effect. For a copy of the abstract, go to "Association Between Receptivity to Tobacco Advertising and Progression to Tobacco Use in Youth and Young Adults in the PATH Study," published in JAMA Pediatrics. For more information about e-cigarettes, see NIDA’s Electronic Cigarettes (E-cigarettes) DrugFacts. For information about cigarettes and other tobacco products, see NIDA’s Cigarettes and Other Tobacco Products DrugFacts. For more information about the PATH Study, visit the PATH Study webpage. NIDA. "E-cigarette ads associated with cigarette smoking initiation among youth." National Institute on Drug Abuse, 26 Mar. 2018, https://www.drugabuse.gov/news-events/news-releases/2018/03/e-cigarette-ads-associated-cigarette-smoking-initiation-among-youth. NIDA. 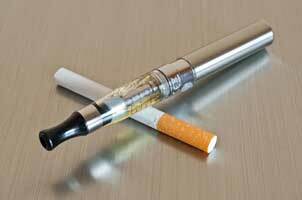 E-cigarette ads associated with cigarette smoking initiation among youth. National Institute on Drug Abuse website. https://www.drugabuse.gov/news-events/news-releases/2018/03/e-cigarette-ads-associated-cigarette-smoking-initiation-among-youth. March 26, 2018.